July 2015 • SMT Magazine 73 5 The Truth about Conflict Minerals Reporting Section 1502 of the 2010 Dodd-Frank Wall Street reform and consumer protection act requires companies to disclose annually whether conflict minerals exist in their supply chains. The first re- port to the SEC was due May 31, 2014. bloom- berg reported that only 6% of companies met an "acceptable standard of compliance." 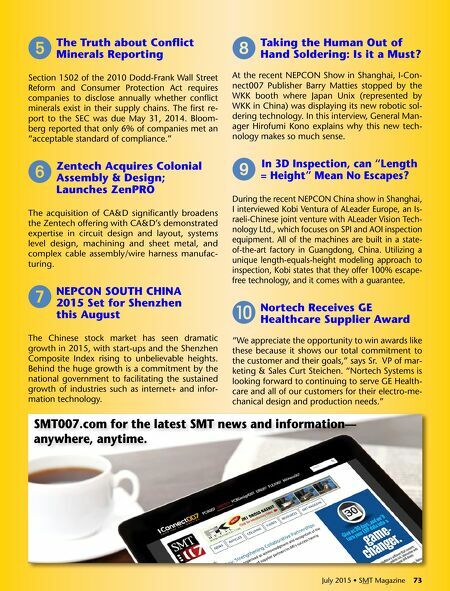 6 Zentech Acquires Colonial Assembly & Design; launches ZenPRO The acquisition of ca&D significantly broadens the Zentech offering with ca&D's demonstrated expertise in circuit design and layout, systems level design, machining and sheet metal, and complex cable assembly/wire harness manufac- turing. 7 NEPCON SOuTH CHINA 2015 Set for Shenzhen this August The chinese stock market has seen dramatic growth in 2015, with start-ups and the Shenzhen Composite index rising to unbelievable heights. behind the huge growth is a commitment by the national government to facilitating the sustained growth of industries such as internet+ and infor- mation technology. 8 Taking the Human Out of Hand Soldering: Is it a Must? At the recent nEpCon Show in Shanghai, i-Con- nect007 publisher barry Matties stopped by the WKK booth where Japan unix (represented by WKK in China) was displaying its new robotic sol- dering technology. in this interview, general Man- ager Hirofumi Kono explains why this new tech- nology makes so much sense. 9 In 3D Inspection, can "length = Height" Mean No Escapes? During the recent nEpCon China show in Shanghai, i interviewed Kobi ventura of Aleader Europe, an is- raeli-chinese joint venture with aleader vision Tech- nology ltd., which focuses on Spi and Aoi inspection equipment. all of the machines are built in a state- of-the-art factory in guangdong, china. utilizing a unique length-equals-height modeling approach to inspection, Kobi states that they offer 100% escape- free technology, and it comes with a guarantee. J Nortech Receives GE Healthcare Supplier Award "We appreciate the opportunity to win awards like these because it shows our total commitment to the customer and their goals," says Sr. vp of mar- keting & Sales Curt Steichen. "nortech Systems is looking forward to continuing to serve ge Health- care and all of our customers for their electro-me- chanical design and production needs." 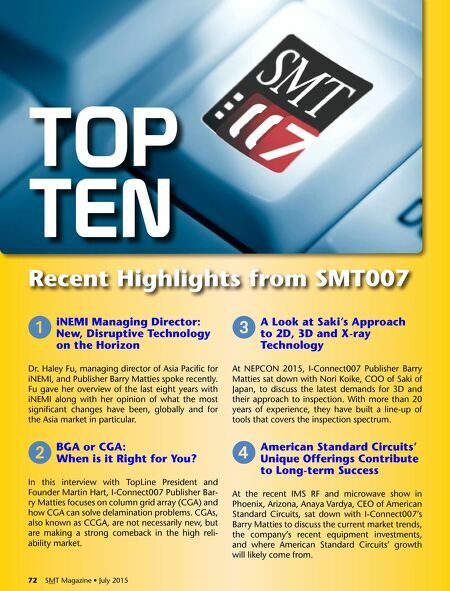 July 2015 • SMT Magazine 73 SMT007.com for the latest SMT news and information— anywhere, anytime.